If you have been a fan of the Naked Chef’s (Jamie Oliver, for the uninitiated) restaurant in Delhi, you would be delighted to know that they have introduced an expansive Sunday brunch menu for their gleeful customers! Designed like Jamie’s personal kitchen with racks of his cookbooks- the place presents a welcoming vibe. Being just the first day since they introduced the brunch menu- the place was brimming with folks eager to try everything they had to offer and we couldn’t be more excited to begin our food-pedition. We got a couple of mocktails to try with our upcoming brunch and both of them were so good that we downed it before we could even be done with the appetizers. 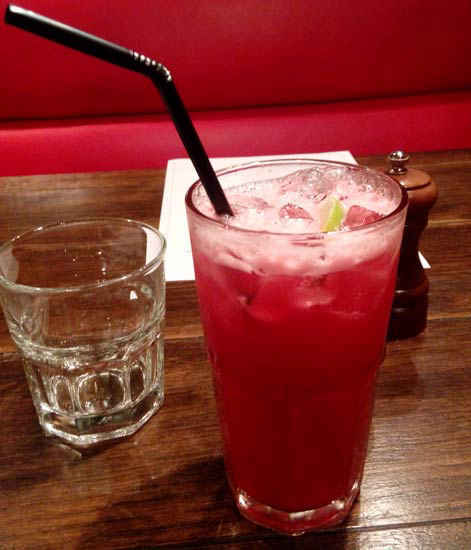 We picked the Berry Blast that had strawberries, passion fruit, lemon and cranberry juice and the Ginger and Mango Mojito which was sweet mango juice and the ginger gave it a very refreshing twist. We wanted or brunch to start with atypical breakfast but we were already famished and picked out the first thing that drew our attention- bruschettas. 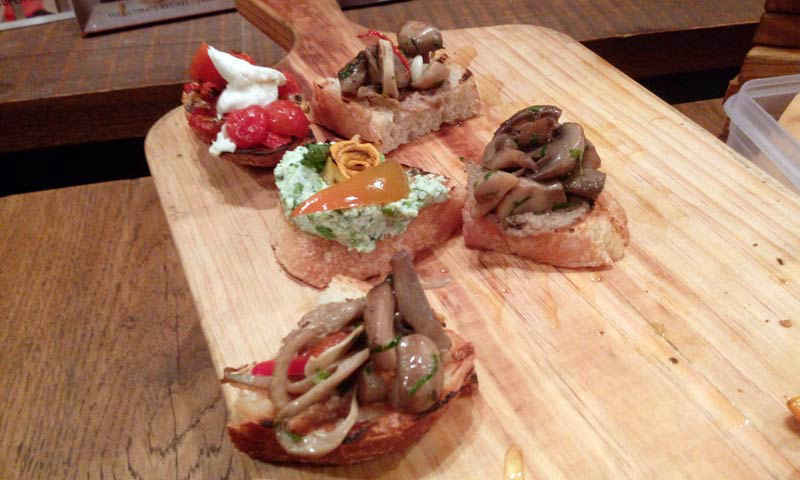 We tried the Garlic Mushrooms Bruschettas, the topping of which was pretty good if you are a vegetarian and love mushrooms. The flavour of garlic in the sauteed mushrooms with a drizzle of olive oil can never go wrong. The other one was creamy Pea and Ricotta Mash with Grilled Vegetables which was a little sweet but be warned it can pass of as fairly bland if you love your spices. The only glitch was the crostinis turned soggy and tough since they had been sitting out for some time. Who doesn’t love pancakes? That’s what we thought before ordering ours. 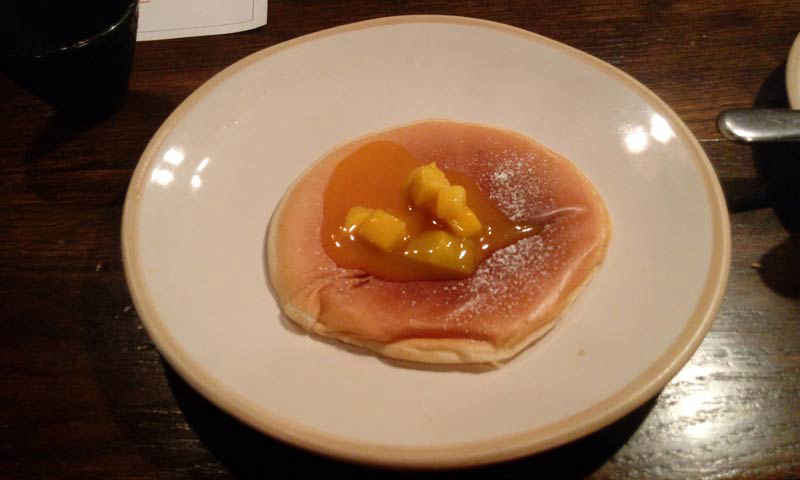 The pancakes were nice and fluffy and we loved the sweet mango compote instead of regular chocolate and maple syrups. However, they also have the availability of the regular options for people who love to go classic. The last two dishes may have given us a lukewarm feeling about the entire brunch but now is when the magic began. 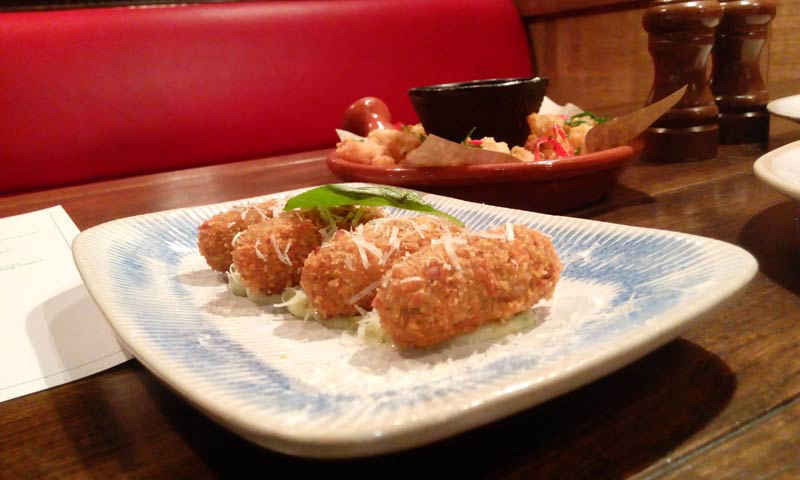 The crunchy croquettes with cheesy mushroom filling were served on a bed of garlic mayo and it was hard for us to stop at one! Each bite was buzzing with deliciousness that came from the mushrooms and cheese and the crunch factor was definitely something we all loved. 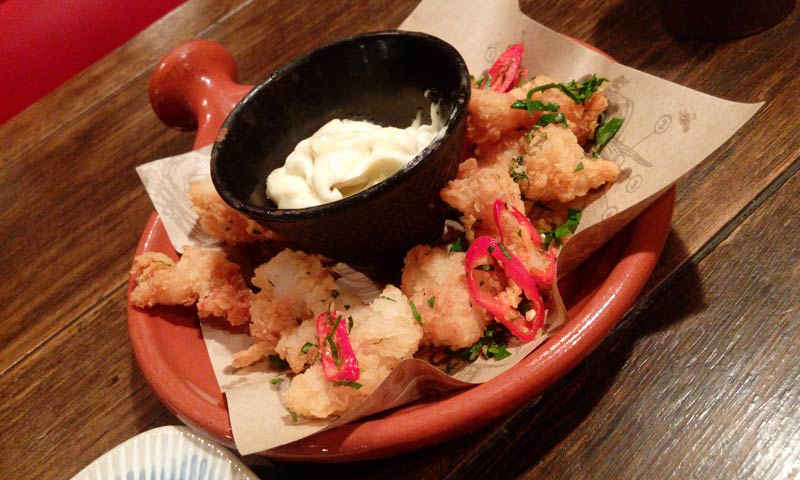 Another crispy and crunchy favourite - an Italian deep fried finger food which had very fresh tasting basa fish and prawns batter fried and was served with a lovely home made tartare dip. And if you follow Jamie’s shows you would recognise the red chilli garnishings that he loves to finish off his dishes with. We already knew that the pizzas here are to die for and our prime motive was to lay our hands on them. We picked the Quarto Fromaggio which is a four cheese pizza consisting of ricotta, parmesan, mozzarella and is finished off with goat’s cheese and arugula leaves on top. Despite being meat lovers, this one stole our heart. The buttery crust and the simplicity of the pizza managed to give it a unique edge. 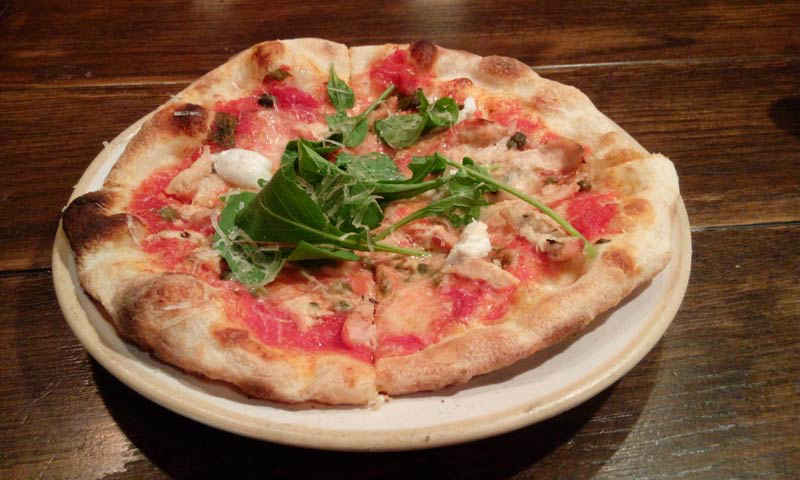 We also tried the Thyme and Mustard Chicken Pizza which had a slight kick from the mustard and it was topped with arugula leaves, goat’s cheese and parmesan shavings. 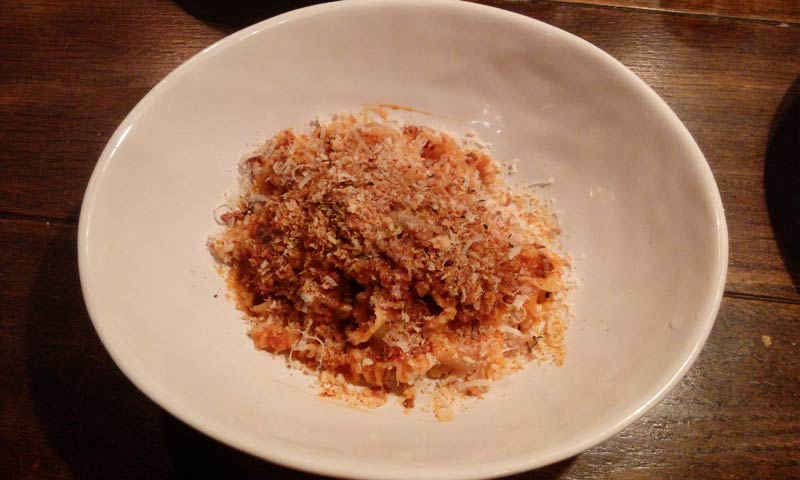 Crushed chorizo slow cooked into a ragout with flat pappardelle pasta and topped with a massive amount of parmesan shavings is a dish that every pasta lover inevitably becomes a fan of. We loved the meat sauce and wiped the bowl clean within minutes! 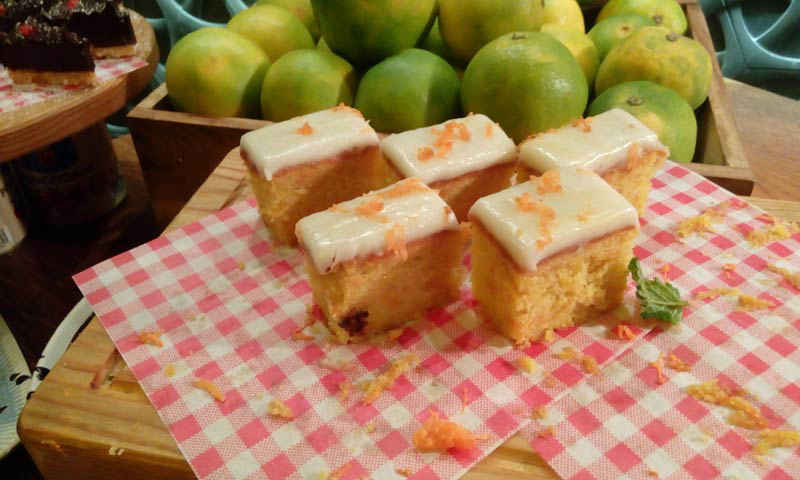 For our favourite part of every meal, we picked out a luscious Carrot Cake with Cream Cheese icing that had a nice citrusy zing from the orange zest on it. We would have loved some cinnamon in the cake but with more desserts on our way we had little to complain about. Next up was the classic English Bread and Butter Pudding that is a comfort food of sorts. Not too sweet, not too rich, this is always a dessert that reminds one of home. Our last pick was a Mango Mousse with Cream Brulee- layered with sponge cake at the bottom, a strawberry mousse, cream brulee and then mango mousse. We loved how the different layers amalgamated together and although the flavours were very different, combined together they seemed to go very well. So, this was the gist of our hearty brunch at Jamie’s and we couldn’t be happier that they placed their best items from the menu into their Sunday brunch menu so one won’t be missing out on anything. Being huge fans of Jamie himself and watching the turnover on their very first day, we could see their brunches turning into a rage among us Delhites!